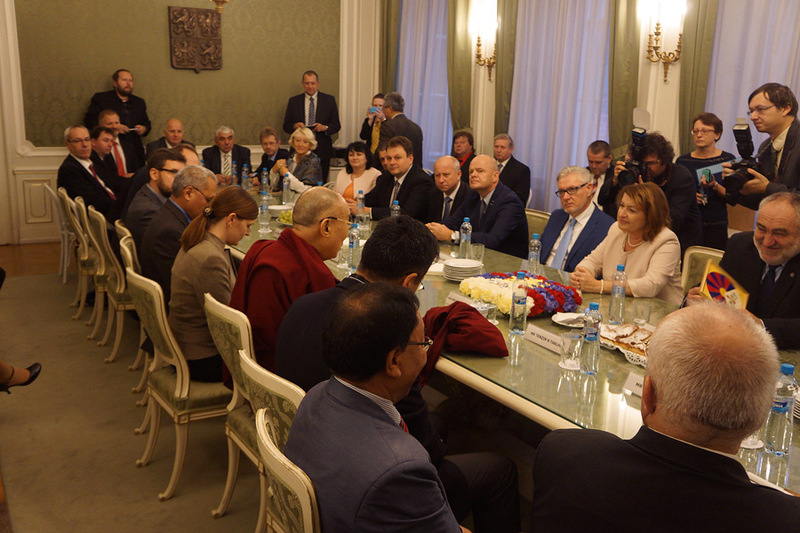 (TibetanReview.net, Oct21, 2016) – Continuing his public engagements in the Czech capital Prague, Tibet’s exiled spiritual leader, the Dalai Lama, on Oct 20 met with nearly 50 members of the country’s parliament and addressed a capacity-packed audience of 2,800 people. Earlier, on Oct 18, anticipating trouble from China, Czech President Milos Zeman, the prime minister and two parliamentary speakers issued a joint statement, distancing themselves from Deputy Prime Minister Pavel Belobradek, Culture Minister Daniel Herman, and the deputy speakers of both houses of parliament’s meeting with the Dalai Lama earlier in the day. The Dalai Lama was welcomed on his arrival at the Czech Parliament in the morning by Miluse Horska, Vice-Chair of the Senate. She ushered the Tibetan leader in for a meeting with 14 Senators and 34 Deputies. The Dalai Lama spoke about his keen interest to democratize the Tibetan political system right from his days in a nominally independent Tibet, his active efforts to continue the process after coming into exile in India in 1959, and his eventual full retirement from political role in 2011. In this connection, he recalled his meeting, a few days earlier, with the President of Slovakia, Mr Andrej Kiska, and said he was impressed by him as a true follower of Mr Vaclav Havel, the first president of Czechoslovakia after the end of communist rule and of the Czech Republic after the country’s split. China has vowed to retaliate against Slovakia for its President’s meeting with the Dalai Lama while also demanding atonement. The Dalai Lama also said he was similarly impressed by delegates from Egypt, Saudi Arabia and Israel he met the day before during the Forum 2000 international conference, and regretted the shortage of time to talk to them. Following lunch, the Dalai Lama drove to Lucerna Palace to address a capacity-packed audience of 2,800 people. The Dalai Lama travels to Italy on Oct 21 on the last leg of his five-nation tour of Europe. He has already visited Latvia, Switzerland, and Slovakia.